The Beatles and Others Autographed Olympia Theatre Program Book (1963). A vintage program book from the 18-day concert event at the Olympia Theatre in Paris, signed by each of the Beatles in black felt tip -- John Lennon and Ringo Starr on their respective photos on the front cover, and Paul and George on theirs on the back cover -- as well as by French chanteuse Sylvie Vartan in black felt tip and by American Pop star Trini Lopez in blue ink. The autographs were obtained by Gilbert Miller, part of the musical comedy act Miller and Archer, who performed on the same bill. Miller befriended the band during the event, and Brian Epstein approached him for advice regarding an offer the band had received to appear on The Ed Sullivan Show -- a venue with which the Beatles were not familiar. The rest, as they say, is history. Miller obtained the autographs for his 11-year-old daughter, and the program book has been in her care ever since. It is in Very Good to Fine condition with spine splits, rusty staples, mild to moderate wear and creasing, and a large piece missing from the upper right corner of the front cover -- part of Ringo's photo -- little of which affects the large, bold signatures. George Harrison's autograph was written on the darker part of his photo, making it a little difficult to fully discern. The item is accompanied by a notarized letter of authenticity from Miller, as well as a copy of the 2004 debut issue of Vegas Report magazine, which includes a four-page article on Miller in which he discusses his encounter with the Fab Four. 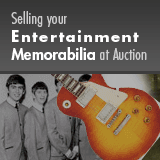 Signed in 1963 before Beatlemania was about to sweep the US, this is truly a vintage piece. Autographs by the group are in high demand -- after 1964 the group was signing fewer and fewer items, and by 1969 very few at all. After the band stopped doing live concerts in 1966, they came together as a group mostly just for recording sessions, and only until production concluded on Abbey Road in August, 1969. A unique item with a great history behind it. Accompanied by James Spence Authentication auction LOA.